Country Living‘s “The Mom’s Guide to Running a Business“, written by Michelle Lee Riberio, looks at the remarkable stories of 28 enterprising ‘mompreneurs’ who juggle family commitments while running their own businesses. The women featured in this book, many of them running home-based businesses, shares how they pursued their passions, the challenges they faced and the lessons they’ve learned along the way. From a single mother of three who quit from the corporate world to run her own all-natural skin care products business iwi fresh, to another who started her fair-trade organic tea business Zhena’s Gypsy Tea to make enough money to fund her infant son’s treatments for a kidney disorder, the stories are full of inspiration and practical advice for any aspiring mother who wants to start her own business. Also included in the book is a “workshop” section that provides essential information on starting a business, from writing business plans to tips on balancing your entrepreneurial endeavors and the needs of your family. What I like about the book is that, unlike other entrepreneur-type books, “The Mom’s Guide to Running a Business” reads like a collection of very personal, intimate stories as opposed to a dry “how-to” guide. The pages are also peppered with very beautiful photographs of the founders, their families and their products, which helps add realism and color to these stories. It’s very Country Living. I’d have called this book “Chicken Soup for the Mompreneur’s Soul”. And that, is a compliment. 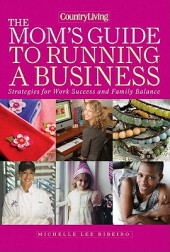 I’d recommend “The Mom’s Guide to Running a Business” to anyone who wants a dose of inspiration, and not just an aspiring mompreneur.